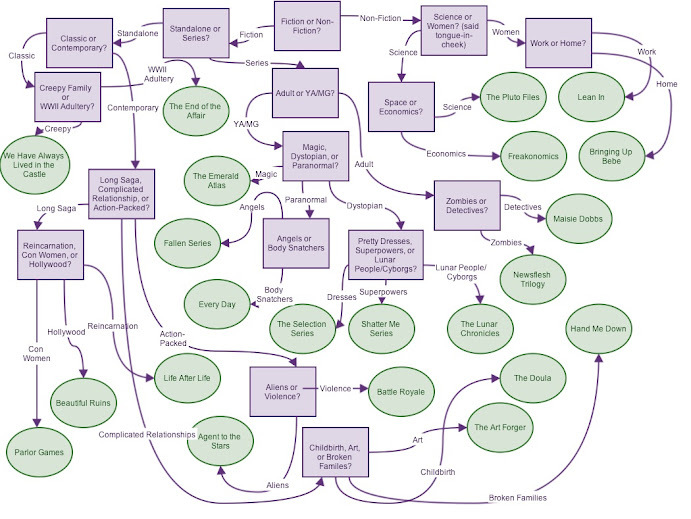 The Audiobook Flowchart Strikes Again – my books. my life. After this was created, I realized I forgot The Absolutist, a very good audiobook, and included Battle Royale and The Pluto Files, mediocre audiobooks. I don’t know how this happened. I also realized that Every Day snuck in there under the “series” group. I think I just put it with the other YA novels by accident. I didn’t have it in me at that point to make changes. Finally, if you don’t have the time to go through this flow chart, my two recommendations for everyone are Beautiful Ruins and Cinder (trust me, the cyborgs and lunar people WORK). So how do I find audiobooks? Well, I discussed this a little on Tuesday. But mostly I just read what Jen tells me to. Wow, that’s quite a chart. I use my local library and Audiobook Jukebox to find audiobook titles. Your flowchart is impressive! Thanks for sharing! I love browsing for audiobooks through my local library systems. Happy listening! Love this chart…I’m going to bookmark this so I can come back when I’m looking for my next audio! Thanks for sharing!!! I followed your chart straight to “We Have Always Lived in the Castle” one of my favorite audios of all-time LOL. You are spot on! WWII Adultery is totally a category I’ve been looking for a book about! (except I’ve already listened to this one). I also recommend Warm Bodies for Zombie lit. So much fun! Pingback: TSS: June 2013 [Monthly Recap] | my books. my life.